Welcome to our 5E blog! This is our weekly communication tool for sharing the fun activities we've been working on all week, assignments that are coming up and exciting links to keep learning fun! To begin, I will be writing the blog but eventually the students will share their thoughts on our blog as well. What a fantastic year to finish off my time with a homeroom class! Looking back on our archives within this blog, we sure were a busy class, full of fun, exciting and productive learning experiences. All of those things can't happen without an enthusiatic and hardworking group of students willing to get "down to business" and that is definitely what 5E was all about this year. The best part of saying "Farewell" this June is that I get to see everybody again next year in the library! I'm very excited about this new adventure/chapter in my career as I will be continuing to take online university courses to pursue my Masters of Education (specializing in Teacher-librarianship) as well as revving-up our Library program at LM! The students finished up their Literature Circle technology projects early in the week and presented them to the class Thursday morning! Interestingly, several of the books in this round of LC's were made into movies. One of my favorite books is "A Wrinkle in Time", an exciting, action packed fantasy, so to celebrate our hardwork with our final round of LC's the students watched the movie and the one group was able to make some interesting comparisons between the book and the movie interpretation. To finish up our Math learning this year, two groups of students presented their Geometry projects to the class on Monday and Tuesday. The students were asked to apply what they had learned from their presentations into an imaginary town map; identifying such things as parallel lines, perpendicular lines, trapezoids, rays, etc. On Thursday, the students had some fun playing with Tangrams. Tangrams are an ancient Chinese math puzzle consisting of 7 geometric shapes to create different forms and figures. The rest of our week was filled with many year end "tidying up" activities and preparations for grade 6. Our theme days of "Munchday", "Chewsday" , "Thirstday" and "Funday" made the week a little more interesting to say the least. I've included a few photos from our week of theme days to show you how much fun we really had....from crazy drinks to overloading on sundae toppings!! As you may have noticed, most of your child's school work has made its way home this week so they don't have a big load to haul on the 30th. Also, you should have received your child's report card on Friday, along with their grade 6 placement for next year. On Monday, the students will be finishing up their posters about Summer Safety! I am hoping that they may have an opportunity to share the important message about "fun and safety" to some of the younger students at LM on Tuesday morning but if not, I hope to have the posters on display at the Lindenwoods Community Center this summer! Monday afternoon, the two grade 5 classes will be involved in some fun games outside from 1:00-2:30 and then finishing off our playtime with a Canada Day themed picnic of hotdogs, chips, drinks and icecream treats. A HUGE thank you to Mrs. Beazley for helping to coordinate volunteers and organize the food portion of this event! THANK YOU! Tuesday will be our final day of school with our annual Canada Day assembly in the morning (along with some desk and locker cleaning too!) Remember to wear your RED AND WHITE clothes!!! For those students who are still around, Tuesday afternoon there will be a movie in our classroom and the students can bring a snack or a drink to enjoy while they watch. Well...I can't believe this year is really over! I will miss everyone so much, as it has truly been a superb year with an absolutely amazing group of students. Thank you for all your support, words of appreciation and help in the classroom. Have a wonderful summer and I look forward to seeing everyone in the library in September. Here's a little "snapshot" view of our final FUN T.U.S.C. meeting of grade 5! Enjoy! This is it folks...countdown time...7 days and counting!! What a fabulous day on Friday for our Carnival! A HUGE THANK YOU to all the parents who helped to make the day so fabulous for the students. They were looking forward to it all week and the weather cooperated too (maybe a bit too much!). We've already started with our "winding down" this week and we have more "winding down" to come. Once again, a big thank you to our parent volunteers who were able to join us for our last Literature Circle of grade 5. I think every book was a big hit this round and we are finishing off our literary genre study with a final group technology project. The students had to choose their favorite (or most appropriate) form of technology that we've learned this year, to present their book to the class! It's a wonderful project that culminates everything they have learned all year about story elements, technology, public speaking and working together as a cooperative group. Next week the students have a few more periods in the Computer Lab and then they will be presenting their book to the class! Speaking of presenting, we had a really FUN T.U.S.C. on Thursday! So much fun, that it took all afternoon to get through all of the speeches! I put a few pictures together in a Bubbleshare to show off their talents. It's been a great T.U.S.C. year! Thank you for all your support at home with the "extra" homework and supportive audience for practicing. It was all about the long division this week! We finished up our last "official" math unit this year on Friday with their final unit quiz on long division. I'll be marking those this weekend and the students should have them back on Monday for you to review and sign. We have 2 groups of students that will be presenting their Geometry projects next week, giving us a mini-unit in Geometry! Geometry is a fun way to end our year in math...tangrams, tessellations and triangles, oh my! With such a short week, the students only had a brief lesson on the "Battle of the Plains of Abraham". We viewed an episode from "Canada: A People's History" that portrayed a re-enactment of the battle; a pivotal moment in canadian history. Next week, we hope to look at the battle from both sides from a more empathetic view point. I'm convinced that it must be our fault that it was cloudy and rainy last week since I was teaching about Weather, because this week, we didn't do any Science and it was sunny!!! Wait, that's not exactly true. The students had fun doing a scavenger hunt of the Weather Map found in the Winnipeg Free Press. For many of the students, it was their first time looking at that section of the newspaper and for others, they had no idea how much information was actually available in the newspapers weather section!! It was an eye-opening experience. You'll have to watch the skies to see if we're learning about weather or not next week! I'm hoping everyone has received my letter home about our last "week and 2 days" of school! We have a fun week of "theme days" next week to make it exciting for the students. Here's a brief reminder of our events: Monday - Munchday (bring a snack), Tuesday - Chewsday (chew gum today), Wednesday - Weird'n Wacky Day (dress/ hair funny), Thursday - Thirstday (bring a yummy drink for class), Friday - Funday (Sundae Party and afternoon movie). 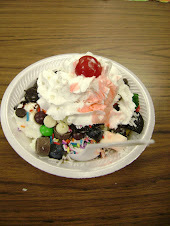 Thank you for your contribution to our Friday Sundae Party...I will provide the ice-cream and the students are each bringing in their selected topping! It's a yummy blast! The students will slowly be bringing home their notebooks and supplies we are no longer using, so they don't have a huge pile of stuff to bring home on the last day! Report Cards will be coming home on Friday, June 26th! HAPPY FATHER'S DAY to all our great dads! We love you! Cirrus, Cumulus, Stratus...NO MORE CLOUDS! I hope our Weather unit in Science has not spurred on this unusually cloudy, rainy spring! It seems that our grade 5 year is still plugging on into June and only 2 and a bit more weeks left of school (despite the weather). Once again, this class astounds me with their focus and willingness to continue learning and growing even into our last few weeks... and a few extra quizzes tossed in here and there! Our final literature circle discussion will be held on Wednesday, June 17th. The students need to have finished reading their novel and have their assigned role completed along with one page of responses by Wednesday! A big thank you to our parent volunteers this round who were able to join us on our whirlwind tour of Literary Genres! We had our final T.U.S.C. meeting on Wednesday this week (which ended in the biggest sigh of relief as you can imagine!). Everyone is excited as they prepare for our FUN T.U.S.C. meeting on Thursday, June 18th! I think it will be a yummy one too as we have 4 healthy snacks being prepared for the meeting (I guess that role was a big favorite!). We are into our final unit in Math this year...long division! Again, this concept requires a lot of practice and drill to really engrain the concept and strategies into our mathematical thinking. The students were introduced to the concept with a fun lesson about "Remainder Joe" (as you can see in the photo on the blog). We started slow with the idea of "reverse multiplication" and have worked our way to 2 digit division with one remainder. On Friday, the students were introduced to two different strategies for dividing into 3 digit dividends. With some practice over the weekend and next week, we will hopefully have this mastered in preparation for grade 6. An assessment of their understanding of division will be come in the form of a quiz on Friday, June 19th! Our final few days of math will look at the world of geometry...always a fun and easy way to end the year! Weather...what more can I say...not a fun topic to discuss lately!! We've been having some interesting discussions and lessons this week about air as we explored the differences between air masses, fronts and air pressure. We had a rousing game of Weather Jeopardy on the SMARTboard Thursday to prepare the students for their quiz on Friday. Over the past month we've managed to cover the essential learning outcomes for this unit, so over the next week we will have some fun researching weather disasters and how to keep ourselves safe! This past week we've been learning about the parts of a textbook and the various strategies to use when reading expository text. Of course at the same time, the students have been learning about the colonization of the English in Newfoundland and Halifax before their big battle against the French! Next week we will be looking more closely at the lives of a soldier during the time of the famous battle on the Plains of Abraham. It's been numbers, numbers, numbers this past week! I've done something I rarely do...give a pop quiz! The students faired very well. Of course this was not a formal evaluation for the report card but merely a means for me to assess their understanding thus far. Next week we will begin our application of our number vocabulary into the idea of how to tell time...en francais and make our own personal clocks to have fun telling time. "Quelle heure est-il, s'il vous plait?" Just a reminder that there is NO SCHOOL on Monday, June 15th for report card writing! Next week, a letter will be coming out addressing some special activities we have planned for our final week (and 2 days) of grade 5, to make them fun and exciting! Tuesday, June 16th...all library books must be returned to the library. There will be no more exchanges until we resume in September (with me!!!!). Have a fabulous weekend! "Here comes the sun, little darlings!" Check out our POETRY GLOGS at http://5epoetryglogs.wikispaces.com or click on the link on the glog below where it says : Welcome to 5E poetry glogs! 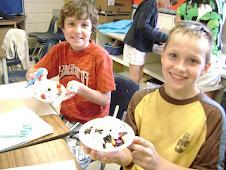 Well, on June 4, 2009, ONLY the grade 5’s (5E, 5L, and 5H) put on the event, Empty Bowls. This event is a fundraiser for Winnipeg Harvest. Winnipeg Harvest is a non-profit organization that is run by volunteers! People that cannot afford to buy the food to feed themselves and their families can go to a food bank like Winnipeg Harvest, and get food. So, why exactly is it called “Empty Bowls”? Well, with the help of Mrs. VanNice and Mrs. Ans in art class, we created some really cool bowls-first out of clay then into the kiln. We glazed them, then into the kiln again! The kiln is a big oven that the temperature rises to be over 1000 degrees! The bowls turned out really nice, and so cool! That is where the Bowls from “Empty Bowls” comes from. But, the Empty part is to represent the empty stomachs of the people who can’t afford food here in Winnipeg. So, leave your bowl empty. Now, that you know what Empty Bowls is, means, and how it was created, what happened after this fundraiser? You had to buy your child’s bowl. Just with all the buying of the bowls raised a total of $820.00! THEN, the cookie auction raised $191.00. Now, drumroll please… in total, the grade fives here at Linden Meadows raised a total of $1011 for Winnipeg Harvest! Did you know that every dollar Winnipeg Harvest receives, they can buy 20 dollars worth of food! Hooray to us, for raising soooo much money! This is just one of the acts of kindness we can do to make this world a better place. EMPTY BOWLS AND FULL HEARTS! 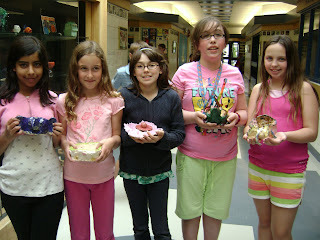 Our blog title this week says it all "Empty Bowls and Full Hearts!". The students put on a spectacular fundraising event on Thursday night! Besides the overall organization of the event, the ultimate product of the evening was all the efforts of our grade 5 students, everything from the bowls to the centerpieces to the entertainment to the decorations! I don't want to take away too much of the limelight from our "Blogger of the Week" so I won't say anymore about Empty Bowls. However, if you missed the evening (or just want to see it again), I've embedded the video from the evening into the blog; so be sure to click on the "WHAT'S UP IN 5E?" at the bottom of this e-mail message to see it on the actual blog. It's hard to believe we could get any other school work accomplished this week with all the excitement, BUT we did!!! Unfortunately, it's what I like to call "crunch time", as I prepare to write their final report cards for grade 5! You've probably already noticed a few quizzes this week and you can expect a few more coming up next week in Science and French. Thank you so much for your support! We are coming close to the end of a FABULOUS year together and I am hoping for a happy and successful finish! Our final unit of Literature Circles has begun! The students have been reading their various genres of books and writing their reading responses. We have added a new element to our final round. Within each group, the students have been given a special role that they must prepare for and share at their literature circle meeting. The roles are: Discussion Director, Connector, Vocabulary Extender, Literary Luminary and Illustrator. Giving each student a role to perform should add a bit more structure and independance to the literature circle discussions. The students must have their book read to the halfway point, written a one page response and have their role ready for TUESDAY, JUNE 9TH! Well, it's finally here...our last OFFICIAL T.U.S.C. meeting for the year...WEDNESDAY, JUNE 10TH! I don't think the students are as excited about our last offical meeting as much as they are looking forward to our "FUN T.U.S.C." where they can choose their favorite role to "do again" without getting evaluated by me! It's been a full week of math as the students have been practicing their long multiplication skills...and practicing and practicing! We finished off the week with an assessment of their learning on Friday. Next week begins our dive into DIVISION and of course the various long division strategies! The students received their assessments for their New Fance letters on Wednesday. Please return their rubrics signed once you've had a chance to review it. I was blown away this week correcting their New France tests. It seems that by putting themselves into the "shoes" of a colonist in New France helped them to really understand the concepts we covered during our unit. To finish off our year learning about early Canadian history, we will take a look at the role the English played in establishing Canada and of course the infamous BATTLE OF THE PLAINS OF ABRAHAM! It's been a cloudy week in 5E (no pun intended)! We've been learning all about clouds...how they are formed, what they are made of, what types of clouds produce what weather and more!! The students worked in pairs to create CLOUDY posters using cotton balls to display the various clouds in the sky. Next week we will be learning about the properties of air, air pressure, air masses and how this affects our daily weather. I would like to have a quiz on their understanding of what we've learned about weather so far (hopefully by Friday) but I can't be sure that we'll be ready, so I'll keep you posted through your child's agenda. Thank you for understanding. With so much going on in our core subject areas, our French unit on Numbers has been "lagging". We will jump back into our unit this week and again have a quick assessment of our learning later in the week or early next week! C'est la vie! I'm working on putting the students' POETRY GLOGS onto a wiki so that you may view them altogether! I'll keep you posted. The annual LINDEN MEADOWS CARNIVAL is back again!!! The carnival date is June 19th and the early selling of wristbands begins Monday. Hopefully you received the gold colored sheet on Friday. Everything you need to know about the Carnival is on the pamphlet! Volunteers are GREATLY needed at this event and much appreciated by our hardworking Parent Council. If you are able to help for even just 30 minutes, that would be fantastic! Library is on Tuesday! I believe this will be our last book exchange before Mrs. Husack and Mrs. Plexman begin their year end inventory of books. Only 16 more days of grade 5...let the countdown begin! Who could possibly eat all that? Oops! It appears I left the pictures on my computer at school! Stay tuned next Monday for more pictures of our theme days. I SPY WITH MY "5E EYE"! 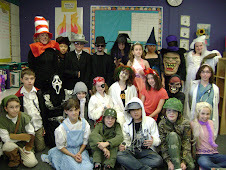 Can you guess who these people are from our classroom? What will you miss the most about 5E? Marissa's "everything fifth grade" web pick! GLOGSTER...click on "login" in the right corner! OTHER CLASS BLOGS TO VISIT! Please do not reply directly to your weekly e-mail blog posting. If you wish to communicate with me, please use my private e-mail heby@pembinatrails.ca or call me at the school.